Anybody else notice the fact that almost all the major buzz bestsellers these days are written in first person? (Twilight, Hunger Games, 50 Shades, Divergent, etc.) It's understandable, since this narrative style allows for a more immersive storytelling, perfect for today's shorter-attention span audience. 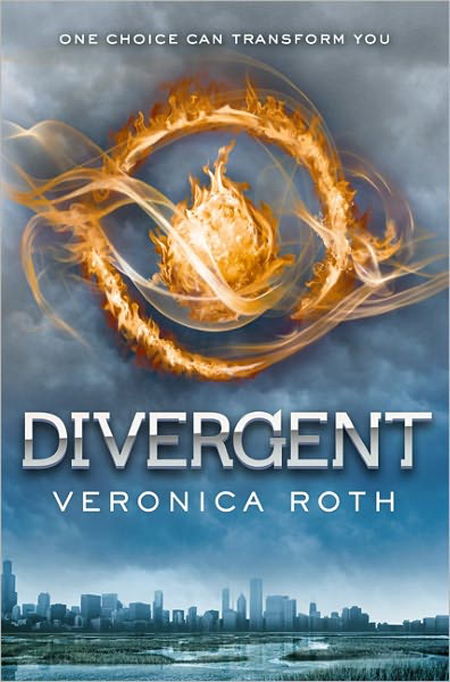 Divergent isn't anything mind-blowing, but it's a fun read and one I thought would be worth sharing my thoughts on. So far, I'd say the story seems more intricately crafted than the Hunger Games, with a world that's crystal clear and holds a logic of its own. I'm also liking Beatrice better than Katniss, and unless the author pulls a Mockingjay, will probably continue to prefer her. Tris isn't all that original of a heroine, but she shows herself to have enough fortitude to be admirable. My guess is this will be part of a 5-book series, since they've got to find some way to continue the trend of one-faction-per-book-cover. My only concern with this is that like a drama, the story will get overdrawn and not have enough plot to sustain it. I've heard some complain of Insurgent already seeming too dragged out, so we'll see. For those new to the series, Divergent is about a world in which people choose factions in which to live out their lives. There's a number of good twists to this through the course of the story, and the overall arc is faintly reminiscent of Goblet of Fire for me - involving a series of challenges the main character must surpass, having everything appear to be going well, until the ending hits with a BAM. I like the complexity of the characters, as the majority didn't just feel like shoved-in personas and I actually grew to care for them. I did think the romance was entirely too predictable, and unless you haven't read any romantic fiction, you could probably guess the ultimate identity of the love interest about 2 chapters in. It actually felt awkward to me when they switched the names on us midway through, but I suppose that was inevitable. There were some inevitable unbelievable aspects, like how freaking small the population of this world seems. There's only 10 initiates a year for a faction like Dauntless? Seriously? Let's calculate, this means that in a 25-year generation, there'd only be about 250 people in this place. And if we can assume an even distribution of people across all factions, would mean there's only about 1300 people in the whole society. That seems awfully small for a contained world, and one very prone to inbreeding. Also, given how hard Dauntless initiation is compared to something like Abnegation's, you'd think the entire faction would have dwindled down to nothing, or that there'd at least be a number-games battle among the factions for who can grow the biggest. Which means soon the world would be almost entirely Abnegation and Amity. Finally, I would have thought that Abnegation would have been vegetarians, rather than eating "peas and plain chicken." Really? That's a selfless meal? Sounds more like a standard American dinner. I mean, you still have to kill the chicken, and from a selflessness perspective, meat is far more costly to raise and consume than vegetables and grains, something that a supposedly advanced society should have long realized. So yeah, I get what the author was going for, but little glitches like this didn't quite compute for me. Am I clamoring for Insurgent? Not really, but I'm at least interested in seeing what happens next. I was confused by why Beatrice was deemed still suitable for Abnegation after her trial. The administrator even said that a true Abnegation person would have answered the homeless man after he said it was necessary for his own good. The fact that she didn't seemed a pretty clearly selfish, and hence Abnegation-ruling out behavior.